Tajima embroidery machine is here to fulfill all your embroidery needs. They come with a single head to multi head embroidery machines. They can perform all the functions with ease. Tajima embroidery machines have always your back with their help you can embroider simplest to the complicated designs with perfection and with complete ease. The Tajima Company is continually upgrading the equipment to keep up with the latest technologies so that they can provide the customers with the high quality service. Tajima offers a variety of embroidery machines options that suit your needs. Their small in size single head embroidery machines are really powerful and they are built at the same standards at which their multi head embroidery machines are built. However, the two head embroidery machine offered by them offers a variety of configurations and a variety of attachments for the perfect and flawless embroidery machine. 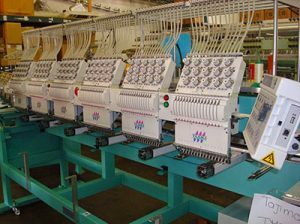 Their four head embroidery machine made easy to embroider the large objects due to the 19 inches of space between the heads and in their six head embroidery machine it has 14 inches between the heads! The 8 head embroidery machine offered by them handles the small runs but they can also tackle the job of any size. Tajima embroidery machine gives the spectacular embroidery results! The Twelve plus head embroidery machines offered by them can do the high volume demanding projects with ease! Tajima embroidery machines are just beyond perfection! Their results will surely leave you in awe. Tajima has over 250 different embroidery machine models that can fulfill any requirement and provide you with the most accurate results! They have worldwide customers. These machines have made our life easy and add beauty in it. However, here at DigitEMB, we use Tajima embroidery machine to provide our clients with the quality embroidery digitizing services with the fastest turnaround and with reasonable rates.